Whether you are a developer creating a Visio-based solution, or are a competent Visio user, David Parker’s excellent offering will help you push Visio 2007 to new limits! 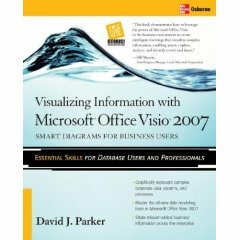 Visualizing Information with Microsoft Office Visio 2007 is not for novice users, but if you are comfortable using Visio and have no trouble browsing to data stored in Microsoft Excel or your company’s databases, then you will benefit from reading this book. If you are a developer looking to create a graphical application based on Visio, well, this is a no-brainer purchase: Just get it! For years, Visio aficionados and developers have praised the virtues of Graham Wideman’s Visio 2003 Developer’s Survival Pack. As time marches on, and it becomes uncertain as to whether an update to the ‘Pack is forthcoming, we are fortunate that David Parker has stepped forward and produced a worthy successor to Wideman’s masterpiece. The beauty of this book is that it explores two sides of so many topics. It explains how to use so many end-user features using wizards, add-ins, and other user-interfaces, and then it explains how to drive these features using code. That’s what makes it so suitable to advanced users and developers alike. I like Parker’s easy-to-read style, which reflects not only a love for Visio and visual problem-solving, but also years of experience dealing with real-world customer problems. You’ll not only learn how to link shapes to data, add data graphics to shapes, use the Database Wizard, visually explore data with Pivot Diagrams, and color shapes by value, but you’ll also enjoy countless anecdotes and a great chapter on Scenarios. 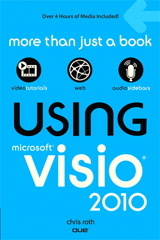 The book’s title hints that it is geared toward linking Visio drawings to data, which it does with aplomb. But I found it thoroughly covered all the important developer-related topics as well: using the ShapeSheet and functions therein, adding data fields to shapes, creating SmartShapes, masters, stencil libraries, templates, add-ins, publishing to the web, creating solutions with the Visio ActiveX and Visio Viewer controls, and finally, packaging solutions for installation and distribution. One last note about the book: I recently took part in a trial-run of a new certification exam, due to be released in September, 2007: 70-545 Microsoft Visio 2007, Application Development. I found Visualizing Information with Microsoft Office Visio 2007 to be a perfect preparation guide for this exam. So if you are looking to add another star to your resume, this book will help you out there as well!